A striking reminder of Cartagena’s colonial heritage and standing proud at the heart of the historic district, Cartagena Cathedral (St Catherine of Alexandria Cathedral) is not only one of the city’s most notable landmarks, but one of Colombia’s most famous cathedrals. Dating back to 1577 and taking over 84 years to complete, the historic church is remarkably preserved, with recent renovations helping to restore its original features. Today, the cathedral stands out thanks to its domed clock tower and bright yellow-painted façade, and makes a popular tourist attraction, as well as hosting daily services. Highlights of the cathedral include a series of exquisite frescos, an 18th-century gilded altar and a gleaming marble pulpit. 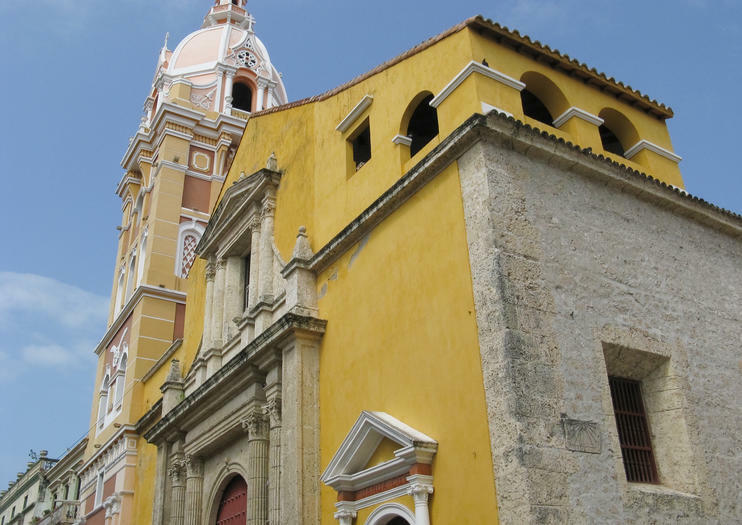 Cartagena Cathedral (St Catherine of Alexandria Cathedral) is located on Calle de los Santos de Piedra in Cartagena’s historic district. Some of Salento’s—also called the Peninsola Salentina—loveliest towns lie just south of Lecce on the “heel” of boot-shaped Italy. With this tour, save time by visiting four of the region’s most characteristic towns in one day, stopping at cathedrals, baroque churches, castles, and public fountains along the way. Let your guide takes care of the itinerary and a driver southern Italy’s narrow highways. Get a quick overview of Cartagena on this guided walking tour. Starting around sunset, wander through the streets of the walled city, passing by the main plazas, historical colonial homes, and museums, including the Plaza of Santo Domingo, Cathedral of Santa Catalina, Plaza Bolivar, the Inquisition Palace, and the Gold Museum. Along the way, hear about the history and legends of the city.